Sjaak de Jong is famous amongst breeders of colour canaries. He keeps canaries for almost his entire life and gained lots of knowledge about them by breeding all mutations that were developed during the past fifty years. His son Maurice shares his passion for these birds and together they earned the title Dutch and World champion for several dozens of times. His passion already arose at a young age. As a 6-year old boy he helped his grandfather and when he was 10 he started keeping birds and joined he local bird association. The colour canaries were quite a new phenomenon when he started. Throughout the years, the colour canary developed and new mutations were created. Sjaak bred every mutations and passed on mutations on different colour variants. Unique is that all of his mutations and modifications are of excellent quality. All families that Sjaak has are developed by himself. To do this right, proper knowledge, experience and the ability to think ahead are of major importance. 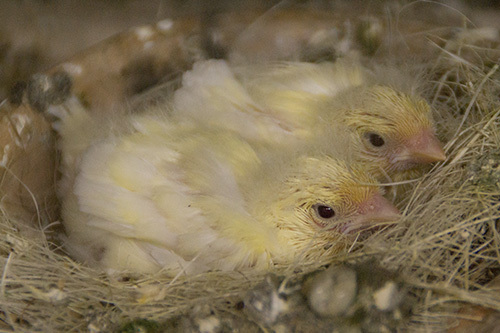 What is essential according to you to breed good quality birds? Besides time, good housing and good care it is very important to gain knowledge abot the colours that you want to keep. Don’t start with too many colours at the same time, for instance two, and don’t keep red and yellow birds together. First gain some experience before you grow. Join a bird club and meet people. This gives you the opportunity to talk to other breeders and ask questions. 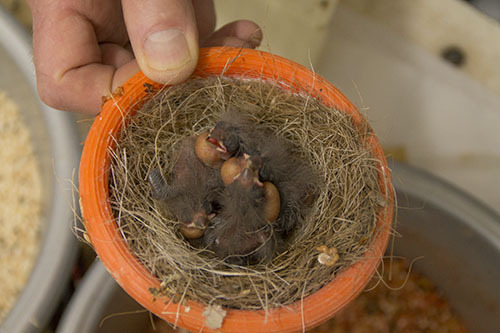 This is important to gain experience and that is essential if your want to breed good birds. What do you think of turnip seed in canary food? I don’t prefer turnip seed in a seed mixture. I is a fine seed with good amino acids, but some animals don’t respond well on it. That does not only count for colour canaries, but for all canary races. The Netherlands is the only European country that desires so much turnip seed in their canary mixtures, sometimes up to 30%. There are better alternatives, such as niger seed and perilla seed. These seeds have a lower risk on undesired colouring of wing and tail feathers of young and animals respond better to these seeds. Moreover, a canary food with more than 30% of high-fat seeds has a higher chance on fattening. That is another reason that I prefer a mixture without turnip seed and a lower amount of fat seeds. The Pro Line seed mixture for canaries is completely balanced in this. Can you tell something about proteins in eggfood? Eggfood needs to be protein-rich and easy to digest. The composition of the proteins is very important: there need to be both animal and plant-based proteins, both of excellent quality. Only then it is possible to meet the essential amino acid requirement. These are necessary for successful breeding results. Pro Line fulfills these requirements perfectly by combining proteins of both animal and plant origin. Moreover, extra essential amino acids are added to offer an optimal protein quality. Besides top products especially for canaries composed with Sjaak de Jong Pro Line offers a broad assortment of supplements and products especially for other bird species.